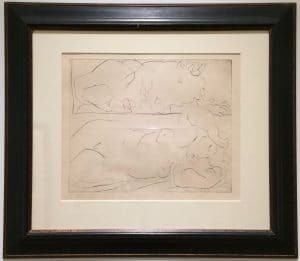 Signature: Picasso did not sign the edition, though most impressions, unlike this proof, bear his estate-stamped signature. Apart from the fourth and final print of the day, which was not very well realized, the other three Picasso created that day are all masterpieces. In my opinion, the drypoint at hand is lovelier than Bloch 201, and it is also ten times as rare. (Although steelfacing hardens the incisions on the plate, thus permitting a larger edition without degradation of the lines through repetitive printing, the steelfacing itself degrades the line’s boldness and burr. Picasso’s choice to avoid steelfacing this drypoint therefore determined its small edition size.) Yet this artwork sells for an order of magnitude less than Bloch 201. Such are the vagaries of the marketplace, in this case partly explained by the imprimatur of the Vollard Suite which the latter bears, as well as by the desirability of Picasso’s autograph. Another likely reason is the spare line of this drypoint, in contrast to the more overworked second frame, as the market tends to value art, at least to some extent, in proportion to its detail. For the artist, the art is a realization of his vision, but for us, the admirers of his art, it is all just a matter of taste. Personally, although I admire the fine details of Picasso’s art as much as the next art lover, I value Picasso’s economy of line just as much. In this wondrous creation, there is hardly an unnecessary detail. To me, the greatness of this artwork, apart from its sheer beauty, is largely due to the precious few strokes of the drypoint with which the master evoked the Minotaur’s emotion, whether love or lust, and the peaceful repose of the object of his desire. 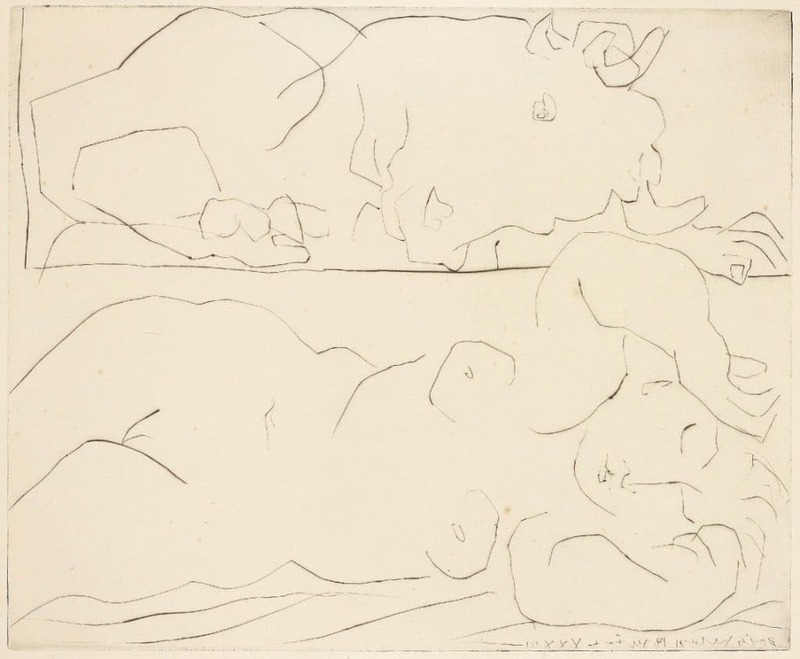 Amazingly, Picasso achieved the beast’s tender expression with but two lines. The first print of the day was an etching, Picasso’s most frequently used printmaking technique by far. Perhaps because of the spare line of this next print, Picasso then took up his drypoint and, when it came time to print the edition, he did so without steelfacing, thereby preserving the burr of the drypoint’s incisions and heightening the boldness of its lines.